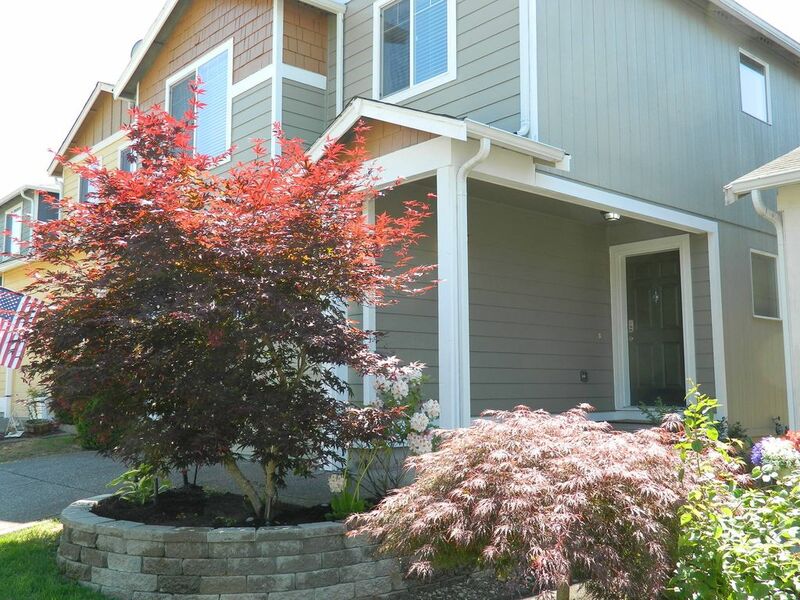 3 bedrooms, 2.5 bathrooms, den, centally located in the Puget Sound area. Newer 2029 sf home with easy freeway access to all Puget Sound destinations. Walk-in closets, 2-car garage and more located in a private community. Only an hour to Mt. Rainier, Mt. St. Helens or 25 minutes to the Tacoma Dome. McChord AFB and Fort Lewis are close by for those visiting our military heroes. There are many great wineries in Western and Eastern Washington within an easy days drive.. Snow Skiing is an hour away at Crystal Mountain or go further to Snoqualmie Pass. The Puyallup Fair in September and the Spring Fair are always a good source of entertainment . Corporate relocation or temporary housing for the insurance industry is our business. I have no idea why the website says our response rate is 90%. This is not true. It is 100%. We have been renting this home since 2005. Feel free to email , text or call anytime. Real estate investor, business owner, and real estate sales and rentals is my business for many years. Arizona and Washington are my markets. If you are wishing to buy a home or rent a short term rental house please contact me for advice and assistance. Protect yourself with my experience. It is in a great central location to shopping and all destinations in the Puget Sound area. Visit Seattle, Olympic Peninsula, Mt. Rainier, Mt. St. Helens, Pacific Ocean, Cascade Mountains, San Juan Islands etc. Also close to Military Bases Lewis - McChord for visiting family and friends. Location and quality of accommodations are second to none. Shopping malls, restaurants, many grocery stores and coffee shops close by. Go to http://vacationrentalnw.net/ for additional rental rate discounts. room for 2 cars in the driveway plus 1-2 in the garage depending on the type of car. Parking on the street is allowed. 3 ROKU TVS WITH WIFI STREAMING OF 1000'S OF MOVIES AND CHANNELS. Home is for rental guests only. It is not for wedding parties or any other type of party. It is for the peaceful and leisurely use of our guests. The home was beautifully furnished and had everything to make you feel at home. The master bedroom furniture was stunning and the bed was very comfortable with a nice big bathroom. It was only my husband and I however from the size of the house I would say 6 people would be comfortable however it sleeps more . There is really no back yard for playing if you have children as the homes are very close to each other. It almost feels like condo living because of how close you are to your neighbors. You only have a view of the backs of the houses from the backyard .The house does not have any leftover provisions from previous renters such as basics, salt, pepper, spices, sugar etc. It did have a nice amount of paper goods. It is a great home if you are going to be on the go and do not need a place to relax in the back yard. Great for business trips and if you are visiting relatives . The community has a playground for children about 2 blocks from the home. Homes are being built on smaller lots these days. Its the way is if you want affordable housing. The property was clean and spacious. It fit our needs perfectly. The property was clean and well kept. It fit our needs and was centrally located to many of the attractions in the are. We were completely satisfied with our experience. This home was extremely comfortable. My family of 6 people stayed in this home and it was lovely. Everyone said their beds were comfortable and there was plenty of space to spread out. The house was very clean and well maintained. The neighborhood was quite and the neighbors seemed friendly. The house is conviently located with stores and restaurants near by. We were approximately 45 minutes away from Sea Tac Airport and 30 minutes from JBLM, not including traffic delays. If we come back to this area, we will rent this home again. I highly recommend renting this beautiful home to families or large groups. Thank you Melinda for your kind words and business. So much space, everyone seemed to have a spot to relax alone. Spacious, clean, & neat. Lots of towels if needed. Great to be able to pull into the garage, although not big enough for two cars. Beds were very comfy. Thank goodness for the central heating instead of those stand alone wall heating units. Washer & dryer are big. Combo to door/garage is the way to go...no lost Keyes or dealing with exchange of Keyes. Perfect location for our family. Owner is very prompt & polite with responses to messages. We'd recommend this home for families, has 3 queens & 1 king, 2 1/2 bathrooms, plenty of dishware for family mealtimes. Yes, we would stay at this home again if we needed to. This 3 bdrm townhouse + loft with bed was immaculate and had all amenities (paper products, bathroom toiletries, garage for car). I was there with 2 friends - we were attending a 5 day seminar in nearby Graham, WA. Very convenient. (Note: listing says has central AC, but it does NOT - this didn’t affect us as weather was nice. 70s during the day and 50s at night). I am sorry but the listing has never said it has Central AC. There is a sign on the thermostat in the house stating that fact also. Its probably a mistaken read. I will however check to see if in all the changes going on with HOMEAWAY there may be a glitch. Folllow up in the description it asks for AC and it said none. However at some point the site listed it as if it had AC. I erased the AC and the "none". Another point is the home is a single family home and not a townhouse. Townhomes are connected to other homes. This home stands alone. Only thing is the AC did not work. We came from Alaska and we need cold it was too hot for us. Good thing is their was fans in every room. But over all was a great house and very clean to stay. The house does not have AC. It has never had AC. It is clearly marked on the thermostat as not having AC. In situations as an unusual warm day you merely open the sliding patio door down stairs and open the upstairs windows to create a venture effect. The 50-60 degree night air will cool the house in very little time. It is not advertised with AC. For those handful of days every year we provide the fans to help with air movement until the cool evening air arrives . You have to open the windows on those few days a year. The home is centrally located for travel to Tacoma, Mt. Rainier, Olympia, Military bases and local colleges and universities.Easy Freeway access to travel to Seattle or Portland, OR. It is also and easy days drive to the Pacific Ocean or Hood Canal. Lot of folks go to the Pikes Place Market or to the Seattle or Tacoma waterfront attractions. The Puyallup Fairgrounds are close by also for the various shows and attractions.